Are you someone who prefers to be on the dance floor, or in the balcony? 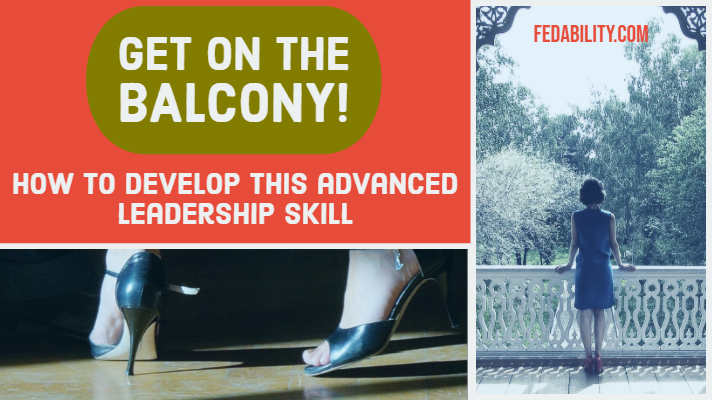 The concept of ‘getting off the dance floor and onto the balcony’ is one that resonates with many people who are looking to build their leadership skills. However, little guidance is given about how to get onto the balcony. This post will offer some activities to practice the skill. And, if this concept of dance floor and balconies are entirely new to you, read on! In Leadership on the Line: Staying Alive through the Dangers of Leading, the concept of dance floors and balconies is introduced as a metaphor for being tactical versus strategic. 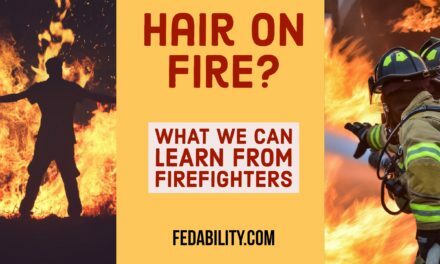 Many managers and leaders are so bogged down with the day to day work of managing and/or putting out fires that they are unable to think of anything beyond what to do next. Or, to think through what the next 5 steps will be, or even what’s causing and feeding the flames. As a result, they are never really able to get ahead of the fire (so to speak). The book gives a good image of the dance floor concept. In short, you can be so busy with the people immediately around you that you begin to think what you’re experiencing is the whole picture of what’s happening. You’re enjoying the music and those around you seem to be as well. So, everyone must be having a good time. However, if you were in the balcony over the dance floor you might see something entirely different. You might see that while there’s some on the dance floor with you…that a majority of people are lined up at the buffet table. Or, that many people are actually straining to talk to each other over the music. At the start of this post, I asked about your preference for being on the dance floor versus the balcony. This is because we each have a natural preference based on our current skill sets, our situation, and our past experiences. Some managers tend to be more involved in the execution of a task (like dancing), while leaders tend to be thinking about the bigger picture and what the future will be (like being on the balcony). Many managers who prefer to be on the dance floor are given a bad rap. But, the truth is that being a really good leader means that you do both. You cannot just stay on the balcony and direct your team from there. Further, there are some people that are better at details where others are better at seeing the larger system. So in answer to the question, “Which is better – the dance floor or on the balcony?” is: neither. Neither is better – both are necessary. Further, the ability and awareness to be able to move from one to another is a requirement of leading effectively. In my experience, most managers seem pretty solid on being on the dance floor. They aren’t always great ‘dancers’ but they are generally pretty comfortable with understanding the concept. If you’re someone who wants to improve your ‘dancing’ skills, I highly recommend looking into project management. This teaches you to think through tactically all the parts and pieces of executing an initiative. You don’t need to get certified in project management – but it’s a good idea to take a class on it. There are always a couple classes on the topic through Coursera. Or, if you have a Lynda.com account, you could consider those classes too. I’d also recommend a Kindle book called: The Persuasive Project Manager: Communicating for Understanding. This is written by a colleague of mine who has worked in the government environment. And, more importantly has been practicing and teaching the art of project management. This book would be valuable even if you’re already a pretty good ‘dancer’ because communication is always harder than we think it is. The more uncommon skill, in my experience, is the ability to leave the dance floor and get onto the balcony. This is where people need the most help in developing a strategic perspective. I’d like to challenge you to do some activities to practice this skill. Even if you’re already pretty strategic – I’d encourage you to try some of them out. And, then let us know in the comments what you learned. The first task I’d encourage you to try out is a stakeholder analysis. A stakeholder, as defined by the Project Management Institute (PMI), is anyone actively involved in the project, who can mobilize (or withhold) resources to support an initiative, and/or whose interests might be positively (or negatively) impacted as a result of the initiative. 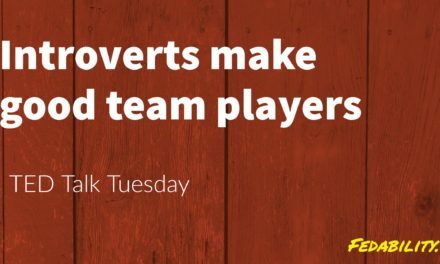 Assuming you are a manager, think about your team. Who determines your budget? Who has the ability to increase or decrease it? 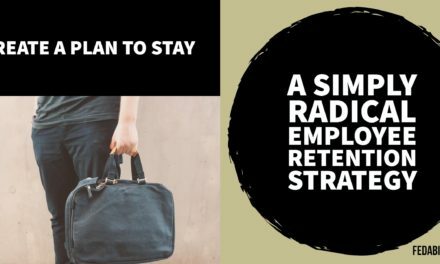 If you don’t have a dedicated budget, who determines whether you can buy something or add a resource (like a new employee)? Who do you and your team depend on to be able to do your work? In my prior position, our training requisitions went through multiple levels of approval across the agency. In an unexpected turn of events, the approver in another office went on extended leave with no one to back up the responsibility. We only discovered this when we started seeing requisitions back up. Prior to that situation, we’d never really thought of the other office as a stakeholder. Is there anyone (or team) whose quality of work could impact the quality of your work? As an example, I was in a situation where we were reporting on mandatory training completions. To do this, we had to know how many people were in the office in order to calculate the percentages. We used the numbers given to us by Human Resources (HR). It wasn’t until we started sending out reports that we discovered that in some cases, HR had wildly inaccurate information about the number of people who worked in an office. Who depends on your work? Think of employees, other offices/departments, leaders up your chain of command, other government agencies, and even (in some cases) the American taxpayers. A second activity that I challenge you to try is an examination of your team’s purpose. If your team didn’t exist, what would happen? Who would be impacted? What wouldn’t get done? Your answers to these questions will likely dovetail with your answers from the stakeholder analysis. However, it starts to get even broader than just your stakeholders. It starts to get you thinking about why your team exists at all. Talk about getting onto the balcony! This can be a sobering question to answer. Because it’s possible that the answer is that nothing would happen if your team didn’t exist. It’s possible that your team has been so busy ‘dancing’ that no one noticed that everyone else had left the dance floor. But, then it allows you to start thinking about what activities your team performs currently – and what you can start doing that will allow you to have an impact. A final task is to observe who has influence, and in what situations. It’s often a fallacy that those who have formal authority are the most influential. Thus, it’s good to take note of who is able to influence others because they can be your biggest supports or your most impactful adversaries. In a very early post on Fedability, we discussed the meaningfulness of where people sit at the table during a meeting. For the next couple meetings, I’d encourage you to take more of a balcony role to let you observe. Observe where people sit in a room. Who regularly sits next to whom? Who participates in quiet side conversations? Is there some people who sit at the edges of the room, away from the table? Observe body language. Watch those in side conversations – do they seem to agree or disagree with the main discussions? Do some people seem to focus on their phones through most of the meeting? And, if so, do you notice that they lift their heads when someone in particular speaks? Or, do they pay more attention if a certain topic comes up? Or, do you notice that some people sit back during certain topics? Do they roll their eyes or have any other facial response to certain comments? Observe who speaks. Take notice of who does most of the talking in a meeting. Does that change depending on what meeting they are in? For instance, do they take more of a passive role in some meeting? Is there anyone who regularly speaks over other people? Anyone who regularly gets spoken over? You’re on the balcony – now what? You’ll notice that I asked you to do a lot of observing in the three activities. You will be making a lot of notes of things. 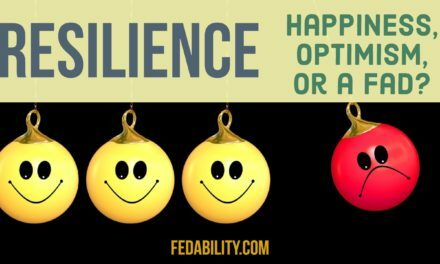 And, you might now be thinking – so now what? The ‘now what’ feeling you’re having is your desire to get back on the dance floor. The stronger your frustration or disappointment with my not offering you a ‘now what’, speaks to how comfortable you are with being on the balcony. So, for now. Do nothing more with your observations. Sit with them. Think about them. Do some more observations. Take note of any trends. Resist your urgency to get back onto the dance floor. Get used to being on the balcony. PreviousAuthentic leadership: Are you doing it wrong?